Description: Delaetia woutersiana cv. Thin Petas is an odd (monstrous) cultivars with very fine petals, cut into shreds. The flowers look quite different, but nice and bi-coloured, yellow and orange-red. Similar mutant having thin petals are found in other cactus species species (see: Astrophytum asterias cv. Showa and Lobivia cv. Stern von Lorsch). 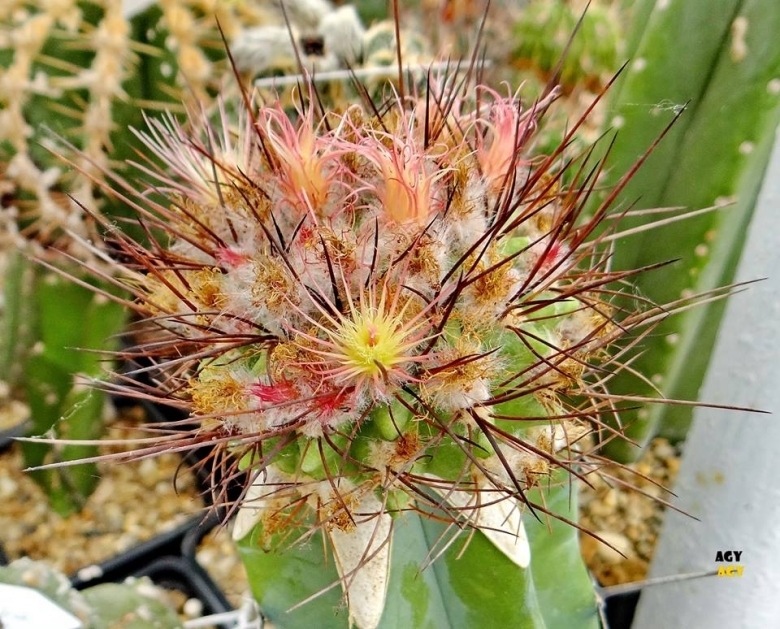 This plants are sterile and are often grafted on stronger species, called the stock, that can be any number of different columnar cactus. Stem: Roundish, grey-green, with finely dotted epidermis, apex often very wooly. Areoles: Large, round to somewhat elongated with white woolliness. Spines: Dark-brown soon turning grey, thin bristly and slightly tortuous. Flowers: Diurnal, radial, about 2 cm in diameter opening widely, yellow with orange/red throats. Petals long, very fine, shred-like, from narrow yellow bases; upper parts orange-red, edges entire, tips entire and pointed. Filaments yellow at bases, yellow above, anthers abortive. Style pink-orange with pink stigma lobes. Note: The name Delaetia woutersiana is not accepted by botanists that treat it as synonym of Eriosyce taltalensis subs. paucicostata, but it still has a value for a collector because they identify plants with particular characters. Cultivation and Propagation: It is a summer grower species that offers no cultivation difficulties, but it is slow growing. Moisture: Water regularly in summer (but do not overwater), keep dry as soon as the temperature starts dropping in October and keep it perfectly dry in winter at temperatures from 5 to 15 degrees centigrade. Exposure: Need a bright exposure, full sun or half shade in summer. Propagation: Grafting (usually used to speed the discouraging slow growing rate of this plant), cutting.